This topic contains 17 replies, has 11 voices, and was last updated by Don 7 years, 2 months ago. Now that we’ve had a chance to follow some of your posts on the forum, a word of caution. Although the CAD files that we released in the Download section are the very same that we used to build a functioning DIYLILCNC here in Chicago, please bear in mind that we were sitting right in front of our laser cutter when we ran those files. As many of you know, there’s nothing so difficult as getting a CNC machine to run a file right the first time. For those of you that are preparing to contract out your panel cutting, we strongly advise getting in touch with the service provider first to talk through some of the potential issues. Primary among potential problems is the tendency for stock (such as Masonite) to vary widely from its listed factory thickness. Even though we dealt with a consistent supplier, we found that 1/4″ Masonite varies in actual thickness between .20″ and .25″. This won’t affect the tab component of the project’s joinery, but it will effect the slot component (found throughout the design). Wherever possible, we recommend that you pick a service provider that you can visit in person. Failing that, try to get someone who is a fellow maker (and more likely to cut some small fit tests for free before you take the plunge). It also seems that some of you are banding together in Canada and Australia to share build notes. That’s great! Once you’ve identified good service providers perhaps we can list them on this forum. If we’re really lucky, we can get them to keep the file on file, smoothing the way for future project builds. Is there an optimum thickness for the plans, as released? 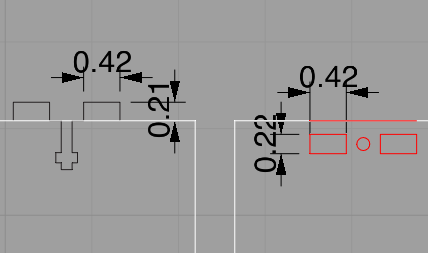 Bill, the slot holes in the CAD files are set for 0.24″. The masonite that we were working with was about 0.2″-0.23″ thickness, but we actually found it was good to have a little bit of play in the T-bolt joints. Another option for those of you better-versed in CAD is to find the exact depth of material being used and adjust the slots accordingly in the file. FYI everybody, we just noticed there is one piece missing from the driver board case. It’s the top panel and we’re working on getting it into the DXF. I will post in the revisions topic when we’ve updated it. Thanks! I am running into a similar problem with the 1/4″ Masonite sheets, but have been able to source a thickness of 0.19″ – is this too small? Or can I use this? Darrel, this should be no problem structurally; If you leave everything as is, the tabs will not fit as snugly and may stick out too far. So you may want to adjust the tab & slot lines in the DXF to more closely match that material depth. In any case, I’d recommend doing a test if possible to see how the fit is. Rash young man that I am have had the parts cut before reading up on the T-bolts. Any suggestions on cutting slots at this stage? Did you have the file from our the downloads section laser cut? If so, you should already have slots on your panels. If you somehow have the overall shapes but are missing slots, I suppose it’s possible you could make a little router jig to add slots by hand. Let us know if you go this route and perhaps we can help advise on building a jig. I’m here in Chicago, would you guys be able to recommend a fab shop for cutting your plans? If you’re local to Chicago we may be able to do the cutting for you. Chris and I are still working out the business model, and we’ll get in touch once we’re up and running. In the meantime, look for local schools that have lasers in their architecture/engineering departments. You should be able to pay a student far less than it would cost at a commercial shop. If you’ve money to burn, Elston Metal Tanks is a great shop (though I’m not sure if they do non-metal jobs). Hopefully not waking a dead-thread…. Any movement on that business-model? I’m also in Chicago, and would be interested in having the cutting done for me. Revive away! As I just posted on a similar thread, we’ve just established DIYLILCNC L3C, which is a mission-based model halfway between for and not-for-profit. We should have the first batch of DIY panels for sale in the short term, so keep checking back. What kerf (aka cut width) is built into the dxf plans? I have had widely varied success with my Epilog Helix 24 40w system. Plywoods are notoriously variable. I;ve had moderate success with high grade 1/8″ ply but other plys will either burn or not cut, within cm of points. These files will work with a variety of kerf results. We haven’t tested the plans on every laser, but there have been no complaints thus far. We do recommend measuring all stock before you start cutting, as anything over .25″ will start causing problems. Laser settings are more art than science. We used a 120 watt, but we always recommend that each builder set their own feeds/speeds through trial and error to account for the specific nature of their setup. It’s surprising to hear that MDF and hardboard act differently on the laser. You’re right about plywood – that stuff is so warped I’d avoid it all together. As far as this design is concerned, any rigid material that’s about .21″-.25″ will work. You might consider plexiglass if you’re having wood burning issues. However, as Bre likes to say, plex suffers from the “binary fail”. Looks awful good though! What is the weight of the package with laser cut panel parts? Is it a single package? What are its dimensions?